Hackensack Riverkeeper is available to lead group outings at a date and time of your choice. Schools, Scout troops, nature clubs and more are welcome. Bird-Walks are guided birding trips to unique habitat areas within the Hackensack River watershed (and sometimes beyond). 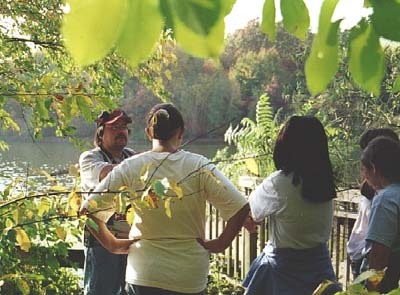 They offer you a chance to gain a more thorough understanding of the birds and other wildlife that inhabit our region. Beginning birders and amateur naturalists are always welcome! The Celery Farm Natural Area in Allendale, NJ. Although not in the Hackensack River Watershed, this is always a great location. This 107-acre municipally-owned nature preserve boasts a bird list of over 340 species! Mehrhof Pond in Little Ferry, NJ. Formed when a clay pit strip mine flooded in the early 20th Century, this unique place hosts thousands of roosting waterfowl every Fall and Winter. State Line Lookout Hawk Watch atop the Palisades in Alpine, NJ. While we don’t do much actual walking, we do have an opportunity to observe numerous raptor species during fall migration when the winds are out of the northwest. At a leisurely pace, a Bird-Walk takes about two hours from start to finish with plenty of stops along the way for birding (and botanizing and discussion as well). Despite the fact that Bird-Walks are walks, not hikes, trails are sometimes muddy or a little uneven so be sure to wear comfortable, sturdy shoes. Also, bring sunscreen, bug juice and don’t forget to bring your binoculars & cameras! $150 for a Group Bird-Walk up to 2 hours. $200 for a Group Bird-Walk up to 3 hours. *Bird-Walks are not recommended for children under the age of 4. Please contact our Program Director Hugh Carola by phone at 201-968-0808 or via e-mail at hugh@hackensackriverkeeper.org. Upon reserving, directions will be sent to you. Steady rain cancels.